The R&B group New Edition blazed a trail through pop in the 1980s; their catchy songs, synchronized moves, and fresh-faced appeal were all building blocks of the boy-band concept. Ricky Bell, Michael Bivins, Bobby Brown, Ronnie DeVoe, and Ralph Tresvant came up from the Orchard Park projects in Roxbury to rule radio, and while ego clashes and substance-abuse issues ruptured them (and led to the addition of another member, D.C.-born belter Johnny Gill), their legacy can be heard in R&B-tinged pop songs and teenage screams over acts like One Direction and 5 Seconds of Summer. 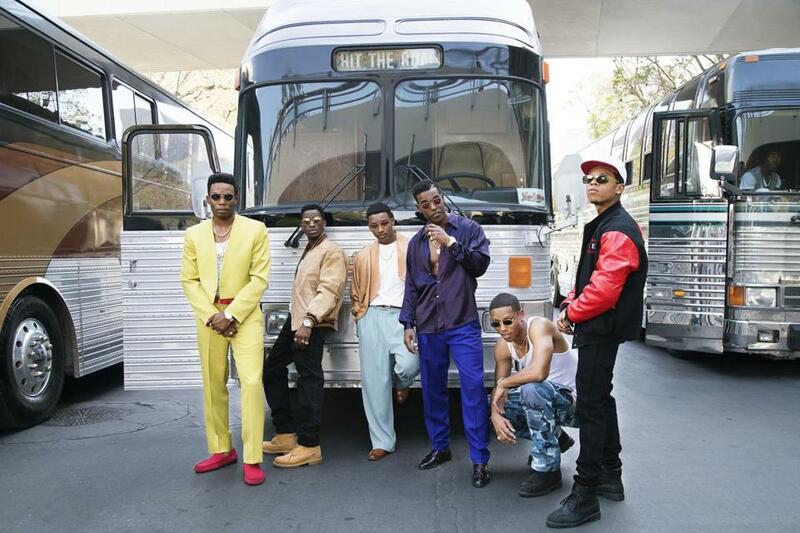 “The New Edition Story,” a three-night miniseries that premieres on BET Tuesday, chronicles the group’s history through its eventual reunion performance at a BET special in 2005. While the story it tells is as old as pop music — a group of talented people stumbles, sometimes because of ego and sometimes because of external factors, while making great songs — “The New Edition Story,” which credits all six members of the group as executive producers, tells the story with verve and charm, meticulously re-creating videos and photo shoots and, more notably, creating rootable characters out of already-familiar stars. The first night opens with a brawl, a re-creation of the onstage melee that happened during a stop on the band’s 1997 reunion tour. But from there, it throws back to when the group was just starting out in the Orchard Park projects, when their interest in singing and dancing solidified into a career. This first episode is full of charm, with the young actors playing the fresh-faced fivesome acting like, well, kids as they achieve No. 1 songs and radio airplay. Near the end of that episode, the young men transform into their older counterparts — and that’s when the trouble really takes hold. Certain aspects of their narrative pop out. The importance of Brooke Payne, the manager-choreographer who shepherded the group through its early years, is brought to the fore, with Wood Harris (“The Wire,” “Remember The Titans”) radiating a paternal-yet-cool vibe even when his character is ousted from the band’s employ. The sacrifices of Tresvant, the silky-voiced de facto lead singer in the band’s early days, are presented matter-of-factly by Algee Smith, and when Gill (portrayed by R&B upstart Luke James) joins the group, watching his trepidation turn to camaraderie elicits a sigh of relief. The story of how the boys — and, later, men — were treated shoddily by the companies and executives who brought them to the top of pop’s heap in the 1980s runs throughout the miniseries, with the band’s first royalty check, for $1.87, being only the first of a series of indignities. And then there’s Brown, the group’s firebrand and the first to exit, who’s played by newcomer Woody McClain with pinpoint accuracy. Brown’s many travails are portrayed plainly, and with just enough sympathy to make the viewer feel for him while also feeling for his bandmates. That all six members of New Edition had a hand in the miniseries’s genesis likely helped shape the nuanced depiction of the band’s successes and stumbles; thanks to fine performances by the actors and New Edition’s killer songs, though, “The New Edition Story” rises above the typical musical biopic. On: BET, Jan. 24-26 at 9 p.m.